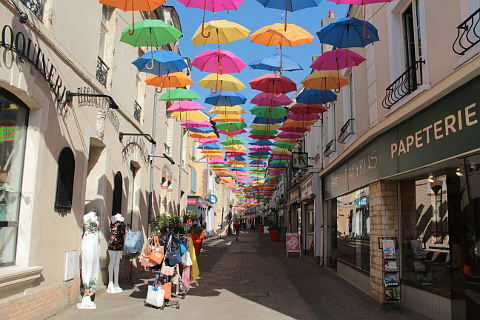 The town of La Ferté-Bernard is situated in the north-east of the Sarthe department (Pays-de-la-Loire region) about 40 kilometres north-east of Le Mans. It falls within the southern part of the popular Le Perche region of France. France This Way comment: one of the most interesting towns in the Pays-de-la-Loire region and with several historic monuments and buildings of interest to see, La Ferté-Bernard is also one of the most picturesque with its medieval houses and the waterways of the Huisne river and the canals. 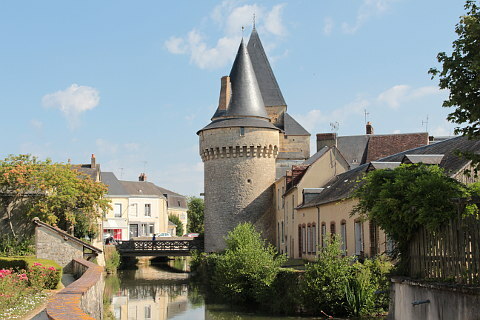 The first monument you will see on entering the town is the Porte Saint-Julien. 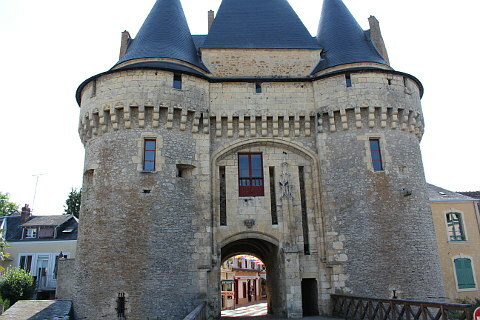 This is one of the historic gateways into the medieval centre that passed the defensive walls, and is a very imposing building with large round towers either side of a monumental stone entrance. 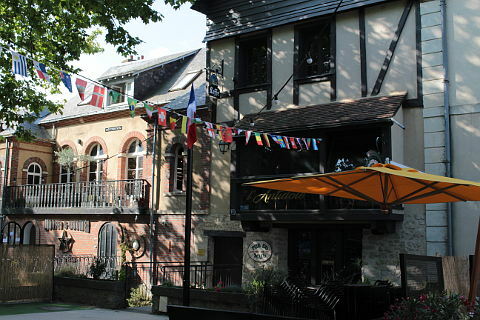 Within the streets of the old town you will find a great deal to enjoy, with numerous medieval houses now carefully restored and often featuring fascinating period details such as medieval wood carvings. 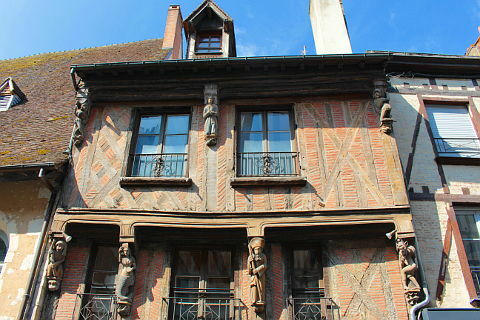 Rue Carnot, Rue de l'Huisne and Rue Bourgneuf include some of the best examples of interesting architecture, along with the small courtyards such as the Cour du Sauvage with the 15th century salt store and the Cour de la Chaussumerie. At the end of Rue Carnot is the traditional market hall of La Ferté-Bernard with its gothic style windows and steep tiled roof. 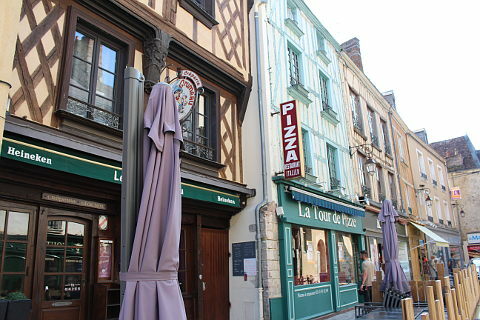 Built in 1536, you will also see the statue of Saint-Louis, patron saint of market traders, on the facade. 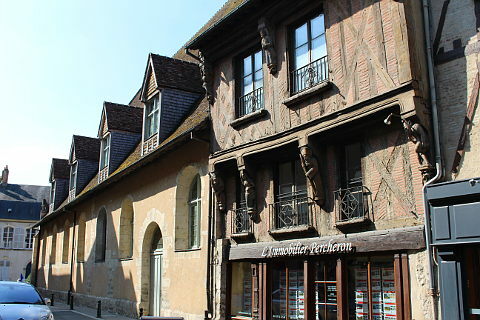 Textiles and grains were sold on the ground floor and the first floor was used for the town council. With a beautiful timber frame roof and oak pillars which are each made from a whole oak tree the inside is very impressive. 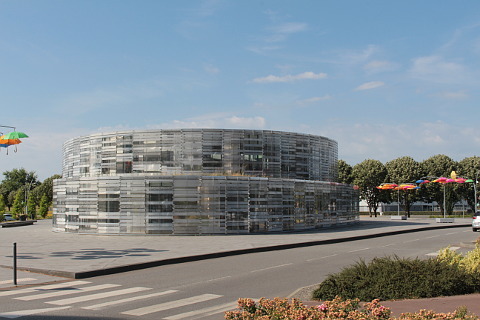 You can ask to see inside at the Office de Tourisme. 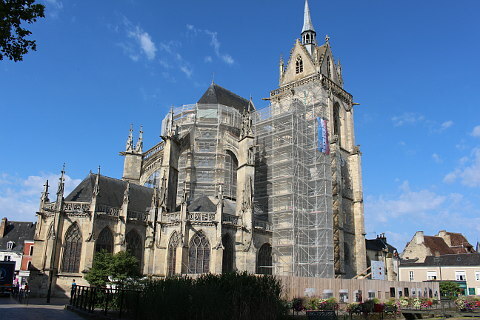 The Church of Notre-Dame-des-Marais in the heart of La Ferté-Bernard is also very impressive. The current church was built in the 15th and 16th centuries in the style called 'flamboyant gothic' and is one of the best examples of gothic architecture in the Pays-de-la-Loire region. The outside of the church includes a round 'rose window', gargoyles and other decorative stonework. To build the church piles had to be driven deep into the swamps which were everywhere at the time - hence the name of the church, 'Our Lady of the swamps'! 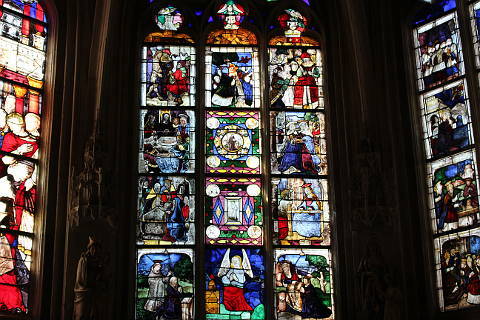 The inside of the church is largely in the Renaissance style and among other features of interest you can see some really beautiful stained-glass windows that were added at various times over the last five centuries and a 16th century organ. When we visited someone was playing the organ - beautiful! There is also a treasury in the church. One very unusual feature inside the church is the raised balcony around the edge which is made from stones carved into letters, which together spell the words of a hymn. It's not very easy to follow the words visually but it's a nice idea! In stark contrast to the decorative church you can also see the little Chapel of Saint-Lyphard, dating from the 12th century and beautiful by its simplicity. Various exhibitions are now held in the chapel. 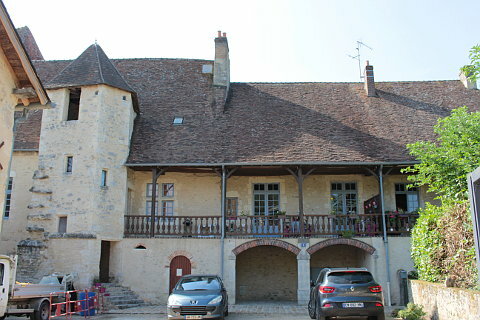 La Ferte Bernard grew up around a fortified castle which was built in around 1030. Two towers, some walls and a 15th century wing still remain of the castle. 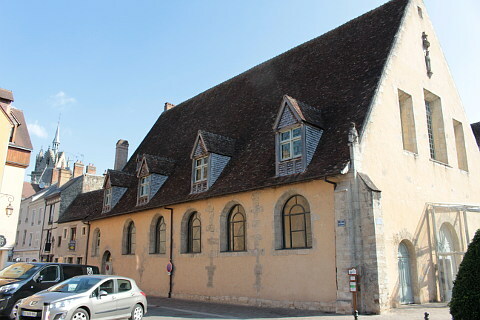 The Chapel of Saint-Lyphard was the chapel of the castle and was used as such until 1795. 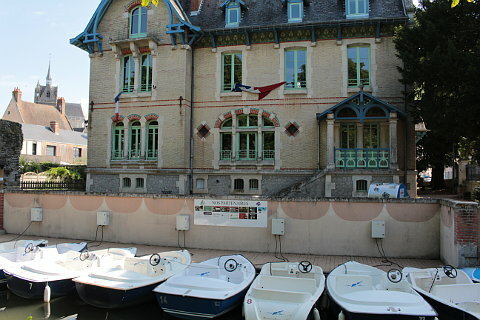 La Ferté-Bernard is a popular tourist destination in the summer, and during July and August you can explore the canals across the town in a small electric boat and look out for the ancient wash houses (lavoirs) along the water's edge. Children will also want to spend some time at the lake near La Ferté-Bernard, where paddling and swimming are very popular in summer along with various water sports. Around the lake there is also tennis, archery, various walks and bike rides and a snack bar. 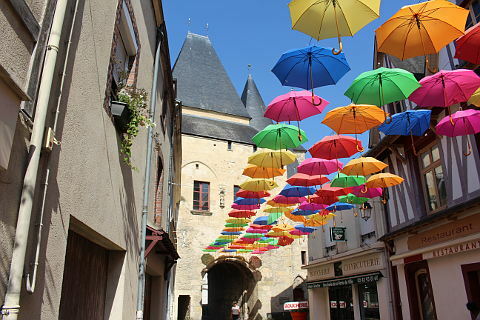 Various other seasonal events are also arranged in the town each summer so be sure to visit the La Ferté-Bernard tourist office at 15, Place de la Lice for up to date information. 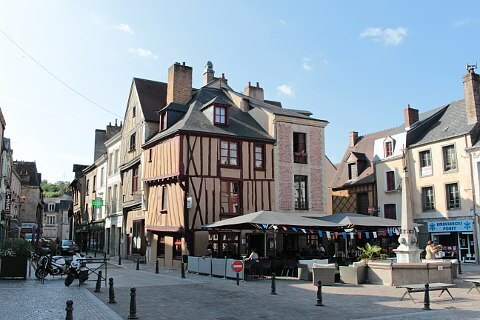 La Ferté-Bernard is located in the Perche hills and other villages to visit in the Perche area include Nogent-le-Rotrou and Belleme. 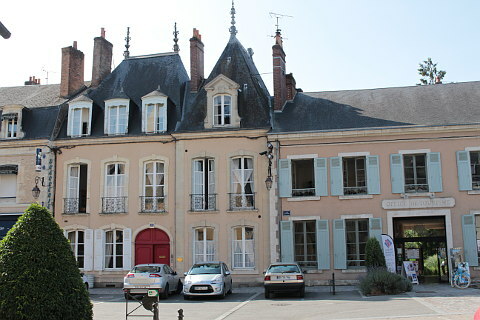 A small distance to the south-east the town of Montmirail is classed as a 'small town of character' and has a hilltop castle with all round views and streets of fine town houses.